I mentioned in Part 2 of this series that I wanted to completely rewire my Japanese Fender ST72-80SC Stratocaster from Ishibashi. This guitar is an unofficial Malmsteen model from 1992 or 1993, for sale in the Japanese market-only, so just for kicks, I decided to up the Yngwie pedigree and change the front and bridge pickups to DiMarzio HS3's. 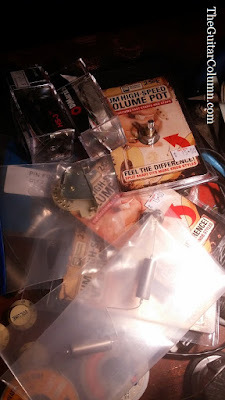 So off I went to Singapore's Haven For All Things Guitar (Peninsula Shopping Centre to you readers from these parts) in search of supplies for the big rewire. I managed to procure a CRL 5-way switch, two .047 Russian military-grade paper-in-oil capacitors, and of course the two DiMarzio HS3 pickups. In addition, I also bought three Seymour Duncan YJM 250k potetiometers. The pots are made by Bourns and are probably the smoothest, fastest pots you can buy. 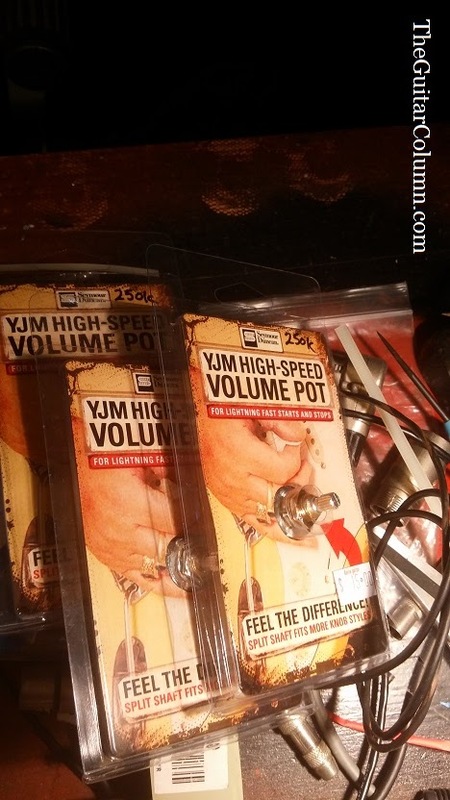 Great for quick volume swells but one must be careful when using these puppies in a performance setting. It's really easy to accidentally turn a tone pot down to zero. But why two capacitors you might ask? 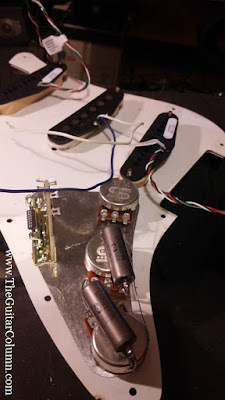 I wanted to get the guitar wired so that the centre tone knob controlled the neck and middle pickups, while the second tone knob controlled the bridge pickup. That bridge pickup can be a beast sometimes, especially through a bright-sounding amp like a Twin Reverb. 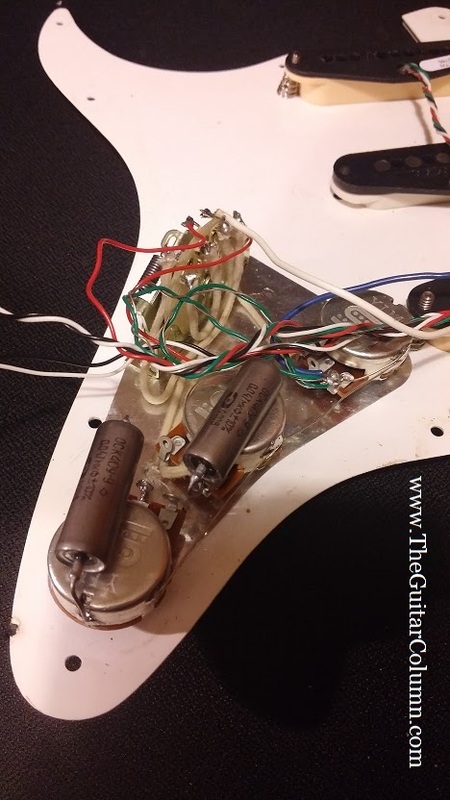 The stock Stratocaster wiring never made sense to me. In the stock layout, the first tone pot was wired to the neck pickup while the second tone pot controlled the middle pickup. 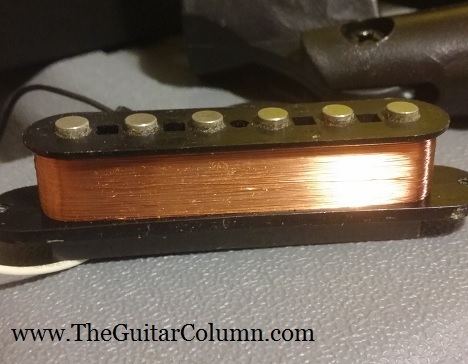 The bridge pickup, the brightest and potentially most brittle sounding of the the three was tonally always wide open. I found that I had to constantly compromise on the amp settings when using a stock Strat. When I got the bridge pickup sounding warm and full, the neck pickup sounded muddy. When I dialed in a bright, twangy, ballsy tone on the neck pickup, the bridge pickup became a raging banshee -- absolute shrillsville. What to do? 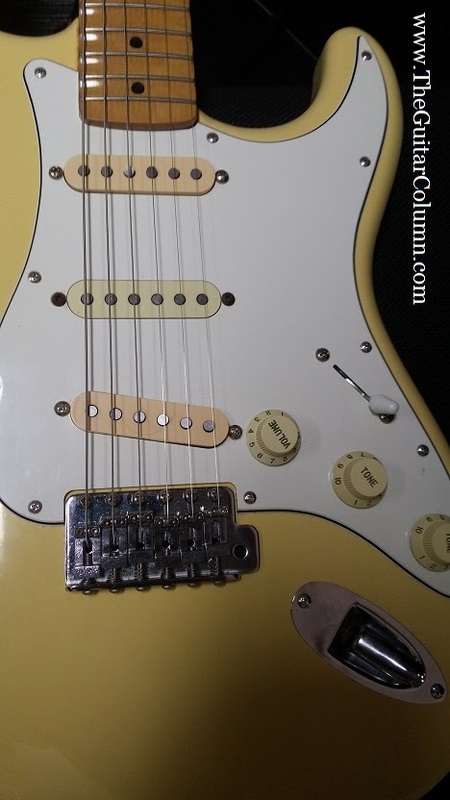 Take a cue from tone guru Eric Johnson and dedicate the second tone pot to the bridge pickup. In this very early article, I mentioned how Joe Bonamassa is also a fan of this mod. Although I'm not sure if his suspiciously overly simple description in the video of moving one wire on the 5-way switch to the left (or was that the right) would actually work. I'll leave wiring my guitars to the pros. Luckily for me, my go-to guy for guitar electronics, our good buddy and film location sound recordist Arnold San Juan, had just wrapped on a TV series he was working on and was on a two-day break before his next project. Arnold, if you remember, also rewired my Gibson BFG Les Paul, replacing the pots and caps, reconfiguring everything to traditional Les Paul wiring -- killswitch be damned. 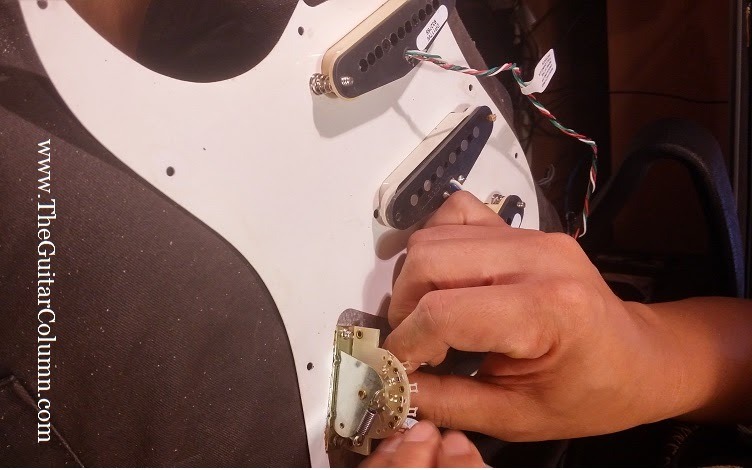 After unsoldering the old Gotoh pots from the stock pickups, Arnold proceeded with installing the Duncan YJM pots. As expected, the shafts of the Duncan pots were a tad larger than the Gotohs which meant that the holes in the pickguard had to be enlarged. Good thing there was a circular file lying about. After seating the new pots in the pickguard, it was time to break out the DiMarzio HS-3's from their packaging. Duncan pots installed. Time to unleash the DiMarzios! The store I bought the HS-3's from only had them in black and white. White would have looked fine, but a single black pickup would really have looked out of place. Fortunately, the store a few doors down had a set of three DiMarzio pickup covers in cream. And they weren't too expensive at 15 bucks. The original owner of this guitar had replaced the front pickup with a generic Fender single-coil, so rather than buying three HS-3's, I decided to switch this pickup to the centre position, with the two HS-3's bringing up the front and the rear. 'Bringing up the front and the rear'. Bet you've never heard that phrase applied to guitar pickups before. The cream pickup covers slipped over the HS-3's without a hitch, but the Fender pickup's coil was too short for the DiMarzio covers. The polepieces were just buried underneath, so I chose the best looking of the three original pickup covers and used that for the lone Fender pickup instead. Using the supplied DiMarzio pickup screws and springs, Arnold mounted the two HS-3's in the neck and bridge positions. Oddly enough, we found that none of the original screws fit the mounting holes of the Fender pickup. All of them simply slid through the mounting holes without engaging the threads. 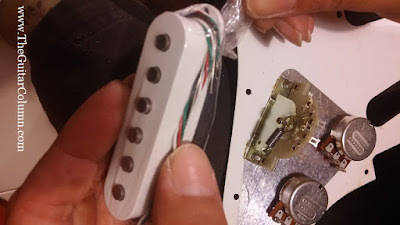 Very strange, considering that the neck pickup was securely mounted with the old screws. Arnold managed to dig up a pair of pickup screws from his tool box that fit nicely although they were a little rusty. Okay, very rusty, but they'll do for now. So why not the new Seymour Duncan Yngwie pickups, the ones that Malmsteen has been swearing are the best ones he's ever heard? Believe me, I was tempted. But after hearing the Duncan Yngwie's and comparing the two, the DiMarzio HS-3's just sounded juicier to my ears. There was a slight compression to the tone of the Duncan's I didn't quite dig, and the overall tone was a little more scooped around the mid-range. But hey, Yngwie swears by them. Our other good buddy, Sherman, recommended I give paper-in-oil capacitors a try when I wanted to rewire my Les Paul BFG. I liked how they sounded on the BFG so I decided to go with .047mf PIO caps for this rewire. So out went the stock dark green mylar capacitor along with the three Japanese Gotoh potentiometers. But does it all really make a difference? To be honest, with better pots and better quality capacitors you can expect a 10% improvement in tone. The pickups and the wood on the guitar itself make for the other 90%, player notwithstanding. But hey, we're replacing 20-something year old parts for a few bucks so why not? It's like wearing a nice, clean pair of socks. No one can really see 'em, but at least you know they're there. 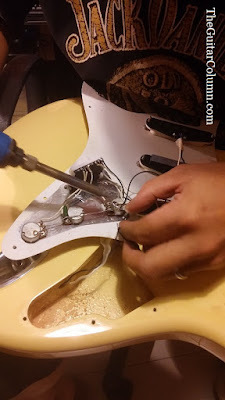 When Arnold did the obligatory screwdriver tap-test on the pickups, we found that the Fender pickup, relocated to the middle position was the loudest of the three. DiMarzio HS-3's are known to not be very hot, but I found it a little strange that they would have less output than a generic Fender single-coil. Setting the middle pickup low and flush to the pickguard a la Yngwie helped to even out the volume difference. And I'm glad I didn't go with three HS-3's. The stock Fender is a nice contrast tone-wise and I often find myself playing off the middle pickup by itself, something I never used to do. The DiMarzio's by themselves do the job very nicely. They are smooth and creamy at high gain -- a very even sounding pickup with no surprising frequency spikes. But I do miss that typical ballsy Fender twang. Leo Fender wasn't messing around, he certainly got it right way back when.